E pur Grilles flush bolted from the inside. The variant with an increased dismantling protection in the LEGI E system is called LEGI E pur. Here, bolting takes place from inside of the property to be fenced in. 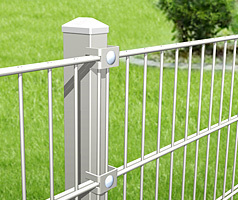 The bolting takes place through a hole in the posts on the property side of the fence, which is neatly closed by a capping plug. From the outside, the only visible parts are the smooth rounded heads of the carriage bolts on the clamping plates. LEGI E pur R Bolted from the inside The LEGI E pur R bolting takes place from the inside. The screws cannot be accessed from the outside.